Ainslie School has both hard wired and wireless Internet architecture across the school. Students are exposed to a wide range of connected electronic devices such as laptops and tablets. We believe that ICT should be integrated as a learning tool within all learning areas, and to facilitate this, specific ICT skills are explicitly taught. This is done with individual children, within classrooms, within small groups or within the school's library. Students build their ICT skills through targeted skills (needs) based instruction occuring on a regular basis. During the past decade, in all aspects of our lives, technology has changed the way in which we seek to communicate, collaborate, analyse and transfer information. 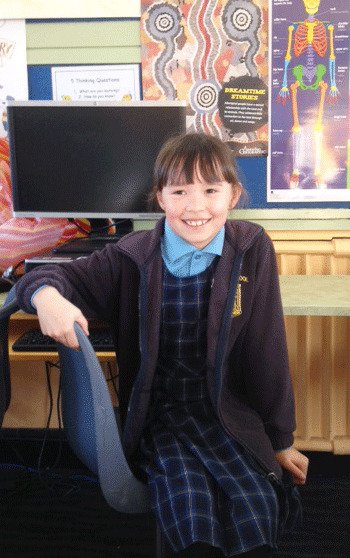 At Ainslie School we recognise that our students are part of a world driven by changing technology. There is an imperative to provide the students with skills, knowledge and values that will enable them to contribute effectively, responsibly and creatively in our online global world. 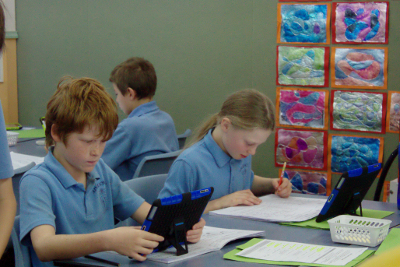 A class set of iPads provide practice with another interface (Apple) to aid learning. This will empower learners to engage in the transformation of learning experiences that focus on engagement, creativity, inquiry based learning and differentiated instruction. Ainslie School is committed to providing a secure e-Learning environment for all students in the school. Students are provided with access to secure Internet browsing and email which can be accessed from school and home. A class set of netbooks allows for explicit teaching using a Windows environment. Ainslie school has an Interactive whiteboard installed in all classrooms, the Japanese language room, music room and the school's library. With the rapid development of technology, students are exposed to a wide range of connected electronic devices such as laptops, tablets and smartphones. Through these they have instant access to the internet and these devices are recognised as beneficial educational tools or learning technologies. To meet the changing nature of technology and to ensure that students, parents and staff are aware of the risks attached to overuse and unsafe use of the internet, staff at Ainslie School teach cybersafety to support students being able to make educated choices regarding these risks. Apart from safety issues and some students being unaware of their digital footprint, cybersafety learning activities include teaching students about the wellbeing risks associated with spending large amounts of time using electronic devices (for example, reduced time dedicated to sleep, study, class work, family communication and outdoor activity). Ainslie students receive a personalised logon for ABC Reading Eggs. This logon is used both at home and at school.